Proven to kill a broard range of bacteria, including; Salmonella ans E.coli, at dilution ratios in excess of 1:200. Helpful hints. As with all cleaners, the use of rubber gloves is recommended. For stubborn deposits apply neat solution and leave to soak for a period. Agitation with a brush or plastic scourer will assist removal of deposits. If in doubt about the suitability of a surface, test first on an inconspicuous area before general application. 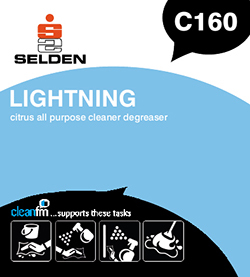 200ml lightning	5 litres of water Heavy Cleaning 1:25 50ml lightning	5 litres of water Normal Maintenance 1:100 25ml lightning	5 litres of water Floors and light cleaning 1:200 30ml lightning	750ml of water Concentrated trigger spray cleaning 1:25 CAUTION – Do not mix with other chemicals. Suitable for hard, non-pourous surfaces.